Recipes for Breakfast, Lunch, Dinner and Dessert. 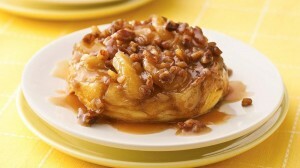 This is a delicious home-style recipe that was entered into and won a bake off contest that Pillsbury put on int 2008. Simply AMAZING. Heat oven to 350°F. In 12-inch nonstick skillet, cook butter and caramel topping over medium-high heat, stirring occasionally, until melted and bubbly. Stir in brown sugar and apples. Cook over medium-high heat 12 to 15 minutes, stirring occasionally, until apples are tender. Meanwhile, spray 8 (10-ounce) custard cups or 8 (12-ounce) ramekins with CRISCO® Original No-Stick Cooking Spray. Sprinkle 1 tablespoon pecans in each cup. Spoon about 1/3 cup caramel-apple mixture evenly over pecans in each cup. Separate biscuits; gently stretch each biscuit until large enough to cover caramel-apple mixture. Place biscuits on top of caramel-apple mixture in each cup. Place cups on large cookie sheet with sides. Bake 18 to 23 minutes or until golden brown. Place cups on cooling rack; cool 5 minutes. Place heatproof serving plate upside down on each cup; carefully turn plate and cup over to remove cakes. Serve warm.